Tenerife holidays have long been firm favourites with British families after that picture-perfect beach holiday. After all, there are some brilliant family-friendly resorts where you’ll find heaps of things to do with the kids, not to mention the island’s incredible beaches. We’re talking striking black sandy shores that look like something out of a sci-fi film, to golden sands and turquoise waters that’s the stuff of postcards. Oh, and if you do get inspired, we’ve also got a guide for finding the top Tenerife package holiday deals. With its palm trees, golden sands and swim-friendly waters, it’s no wonder that Playa Las Teresitas proves such a hit with visitors. The beach also boasts a few restaurants and bars, as well as facilities such as toilets, and can easily be accessed on local bus routes. It can get pretty busy during the peak holiday seasons, but it’s still a little quieter than some of the more bustling spots in Tenerife. Tempted? Jet2Holidays offers budget-friendly packages at hotels close to the beach. Tenerife doesn’t just have typical beaches – the island is renowned for the breathtaking black sand beaches to be found along its shores, a result of previous volcanic activity. Playa Jardin in Puerto de la Cruz never fails to wow visitors thanks to the colourful flowers and dense greenery it’s surrounded by, while the striking black sands make for quite the photo opp. It tends to be better for those who want a leisurely stroll rather than those planning to spend a day sunbathing, although there are loungers on offer. Tempted? TripAdvisor has a handy round-up of holiday rentals not too far from the beach. Playa Del Duque is an ideal beach for families; the long stretch of golden sand means there’s plenty of space, the waters are swim-friendly, and it’s right by restaurants, bars and more facilities. You can easily set up for a full beach day here, and there are parasols on offer to rent for those who want them. Tempted? 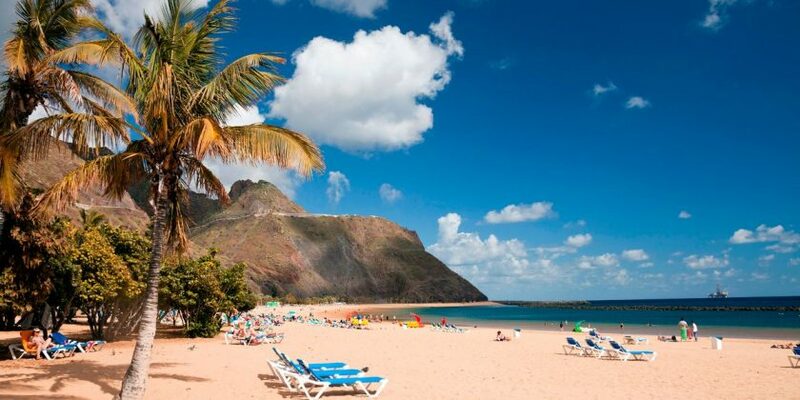 LoveHolidays offers Costa Adeje holidays from £183pp including some hotels close to the beach. A more remote beach on the island, Tejita offers a long stretch of shore that’s ideal for a leisurely stroll, while nearby Mount Roja is a hit with hikers after a walk with a difference. Generally secluded from the wind it’s pleasant for those who want to enjoy the balmy temperatures, but if the weather does change it can get very windy and the huge waves aren’t swim-friendly. It’s worth noting that this is also a nudist beach! Tempted? Expedia has a host of hotel options close to the beach. The resort of Las Americas is filled with restaurants, bars, hotels and a vibrant atmosphere, so if you’re after an action-packed holiday this could be the destination for you. The beaches are long stretches of golden sandy shores, where you’ll find all the facilities you need from toilets to sun loungers and umbrellas. Tempted? TUI offers dedicated Las Americas packages ranging from all-inclusive to self-catering options. Another of Tenerife’s spectacular black sand beaches, El Bollullo is a must-visit for intrepid explorers. Located in a secluded bay, it’s popular with hikers who take on the trails to reach the shores, while the surrounding rocky landscape is ideal for more experienced ramblers. However, you can reach the beach by car if you simply want to take in the black sands and turquoise waters. Tempted? On the Beach has a host of packages including half board and self-catering options in Puerto de la Cruz, a short distance from the beach for those who want to go exploring. One of the largest beaches on the island, Playa de Torviscas can also be one of the busiest. It’s a hit with families wanting to make the most of the sands and swim-friendly waters, while thrill-seekers can get their fill thanks to the plethora of water sports on offer. There are plenty of facilities from beach bars to restaurants and water sports centres. Tempted? Lastminute.com can be a good source for late deals and often hosts flash sales on flight and hotel packages, with prices from £231pp. Las Americas has plenty of beaches but if you want to get away from the main hustle and bustle, Troya Beach should be on you radar. With black sands and pebbles it’s less popular with families and tends to be where you’ll find tourists who want to while away a few hours with a scenic stroll. However, it’s not isolated – there are still plenty of bars and restaurants around for those who do want to stop for a spot of lunch (or cocktails while watching the sunset!). Tempted? First Choice has a plethora of all-inclusive resorts in Las Americas whether you want to be in the heart of the action or a little further out. El Medano isn’t always secluded from the wind, but that makes it a hit with sports fans who want to try their hand at wind surfing and kite surfers. There are sun loungers to be found as well as a few restaurants and bars to replenish your energy, and it’s a good spot if you’re looking for a busy beach that’s not as crowded as other hotspots on the island. Tempted? easyJet Holidays offers a wide choice of packages whether you’re after a budget long weekend or want a week’s holiday in the sunshine. If you’re looking to explore the more rugged landscape of Tenerife then Los Gigantes should be on your radar. With its black sand shores, rocky cliff surroundings and eye-catching plants and greenery, it makes for some pretty incredible backdrops. It’s worth noting that the waters aren’t very swim-friendly and you’ll often find a red flag, so don’t head here planning to take a dip. Tempted? 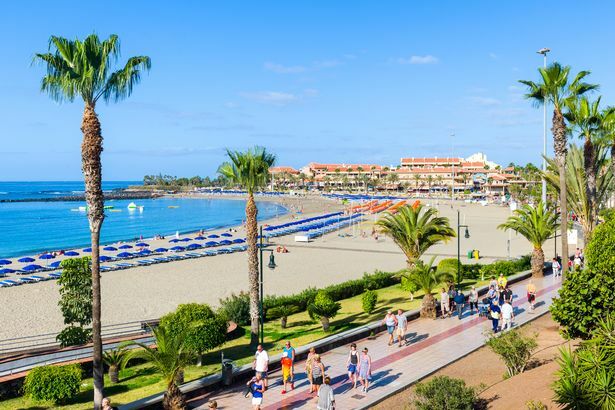 TravelSupermarket is a good source for comparing prices if you cna be flexible with your departure date, and you can find cheap packages to Tenerife from £262pp.